Whether you are a believer or a skeptic of divination, the following are questions you may ask a Korean “saju” reader: Is 2019 a good year to change jobs, start a business, or relocate to a new country? Will I meet “the one” this year? When is a good year to get married, if ever, and will I have a wholesome family? If I heighten my nose through plastic surgery, will my luck slide down my newly straightened nose bridge? Visiting a saju shop is easy. Compared to a “mudangjip,” the house of a shaman, saju shops are much more out in the open and accessible in terms of cost. 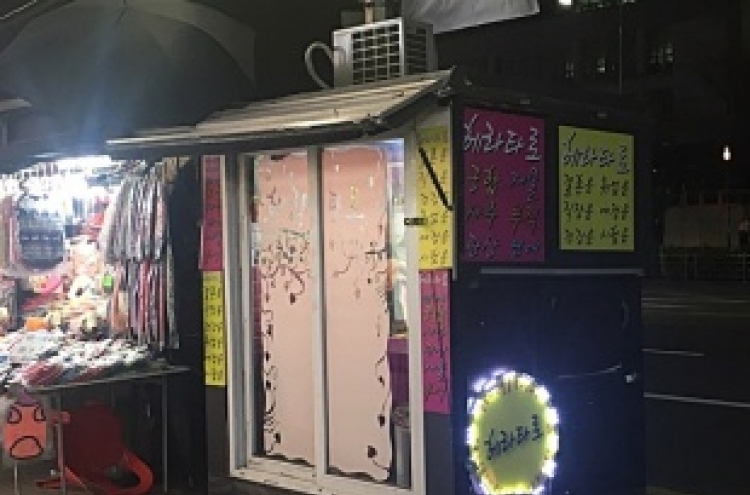 Popular entertainment districts have street-side saju booths, with signs promising answers to all kinds of concerns. Cafe-like saju establishments dot busy areas in town, inviting groups of friends or couples to drop by for a reading. Saju means four pillars, and “palja” means eight characters. A person’s birth year, month, date and time represent each of the four pillars. Each pillar is made up of two characters -- one character for a “heavenly stem” and another for an “earthly branch” -- and these add up to render palja that determines fate. There is a pool of 60 characters, “yukgap,” from which the palja characters are drawn. Each character has a yin or yang energy, and is categorized under the five primary elements of fire, earth, water, wood and metal. There may be overlapping elements in palja, which may strengthen or weaken certain characteristics in a person’s disposition. Palja that has balanced energy is considered good saju. Saju readers measure their customers’ sociability, marital prospects, aptitude and more, at the price of 30,000 won ($26.70) to 50,000 won, and usually in under 30 minutes. Skeptics see saju reading as an expensive form of entertainment -- movie tickets cost around 10,000 won in Seoul -- and counseling rather than a revelation of ones destiny. Devotees view saju as a way to avoid pitfalls or dead ends in life. Saju reading usually appeals to those who seek affirmation of their beliefs or those who are going through an uncertain patch in life, such as students preparing for a make-or-break college entrance exam, and their parents. Seen close-up, saju predicts a person’s luck in a certain year. The year 2019, for instance, is called the year of “gi-hae” in the sexagenary cycle. Gi is a yin-earth character that means yellow, and hae is a yin-water character that represents the pig. A person whose palja has words with more yang, and elements that strike balance with earth and water would do well in 2019. Every person has a change in the general flow of energy in every decade, based on which a fortuneteller would predict roughly what sort of events one would go through in each stage of his or her life, eventually yielding a snapshot of the person’s projected life. Saju businesses are busiest from December through February, when people are curious to find out what the new year has in store. Couples sometimes consider fortunetelling as a fun activity to experience together. They visit saju shops to have their “gunghap” read. Gunghap is a measure of marriage compatibility or how well each side complements each other. Some traditional families take gunghap seriously. A couple might end their relationship upon finding out prior to the wedding that their gunghap is not ideal. “I parted with my college boyfriend of several years after clashing with his family due to our unideal gunghap, which we found out only after he proposed,” said Yoon Seo-rah, a practicing physician who is now a mother of two grown-up daughters. For her, it was not so much the supposedly incompatible match that made her cut ties but more her disappointment at the would-be-in-laws’ unilateral disapproval. When Yoon did marry, she did so with a man she was happy with, regardless of what her gunghap indicated. “I am happily married to my anesthesiologist husband, whose saju said I would benefit him greatly, and my saju not so much,” Yoon said. Her former boyfriend, who was endowed with good looks and a family inheritance, married a woman from Yoon’s graduating class who had arranged with a fortuneteller to fake a birth time that made her a match made in heaven for the man. Did the fake saju have a positive or negative effect on the couple’s marriage? Yoon does not know. Fortune-tellers say that if there is a way to change one’s saju palja, that is through marriage with a partner whose saju will enhance the good and soften the bad. Divination may be a self-fulfilling prophecy, or confirmation of bias, as people tend to hear what they want to hear. True or false, believe it or not, saju can be a cultural experience in Korea and an amusing activity to kill time. There are free mobile applications that give saju readings similar to daily horoscopes. With digital applications, one cannot ask for additional advice as with a human fortune-teller, but there is not much harm in trying out the free service for fun.